It's Friday - time for another Blogger's Challenge. This weeks challenge is Christmas in July - I haven't even given thought to my Christmas Cards yet, as I'm still trying to get my Convention cards completed! Today also starts the TJNL Artwork Blitz - I'll be positing more samples of some of the new TJNL techniques from the August issue over the next week - be sure to check back. Here's the card I created for today's challenge, it uses the Shimmering Resist Technique from the August TJNL. Sorry, the isn't too bright - it's a little dark and gloomy here today. Don't forget to check out the TJNL pre-order for CD#6! 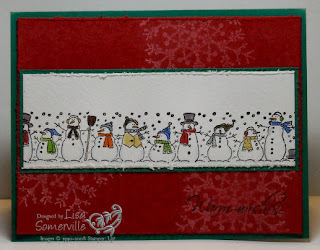 What a great card, Lisa, and a happy group of snowmen! Have a great time at convention...I must see pictures, ok? I just love snowmen so this card is right up my alley!!! It's adorable!! Oh I love that wheel...great job with your card! I finally finished my SSUS swaps. Yeah! See you in SLC! Cool technique...perfect for this card! See you on check-in day! Super cute snowmen! Great background too. Lisa, Love that little row of snowmen, they are so cute. Snowmen are so cute and especially this many!! Cute card!! Very cute! I have always loved this wheel. What a cute row of snowmen! Love the card and what you have done with it. Have fun at convention! Great card Lisa! 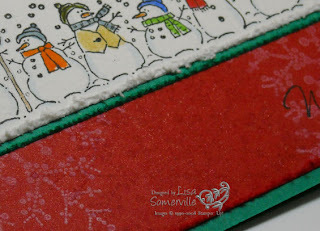 Love the detail under the snowmen, looks like snow! Bring it to convention. Would love to see this live! See ya in a few days rommie! Snowmen! Isn't that a sight for sore eyes this week?!! The heat here is in the 80s and 90s, so just thinking snowmen is a real treat! Love what you've done with this wheel....cute, and oh, so sweet!!! This is ADORABLE! I love the bright, cheery Christmas colors and the technique is very intriguing I can't wait to try it! TFS! I love that wheel Lisa! Great job! Love the card I'm sure I'll be case-ing this for one of my CHristmas cards! The technique looks wonderful too, I can't wait to try it out! Thanks for the challenge and the inspiration!